“The Golden Ring of Russia” is a tourist route that was drawn up during the Soviet era, with the idea of boosting the numbers of foreign tourists traveling to Russia. Today, it remains one of the most popular routes for both visiting foreigners and domestic Russian tourists. 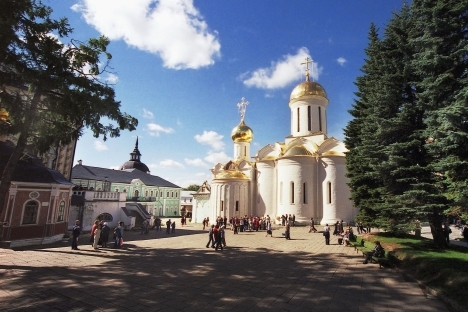 The Golden Ring is made up of towns located in the Central Federal District, including Sergiyev Posad, Pereslavl-Zalesskiy, Rostov Velikiy, Yaroslavl, Kostroma, Ivanovo, Suzdal and Vladimir. You can set off on a trip around the Golden Ring in your own car or take a bus tour. Recently, rail trips around the route have increased in popularity: There are rail links between practically all the “jewel” locations on the route. The conception of the Golden Ring was a significant event in the country’s history, and it owes its creation to art critic and writer Yuri Bychkov. He turned 81 this year, but the 45-year-old history of the Golden Ring began back in 1967 with his Moskvich car. The editors of Soviet Culture magazine, at which Bychkov was working at the time, packed him off to Suzdal to write a piece about the development of tourism. Bychkov set off there in his Moskvich. He decided, however, that going back home by the same route would be a bit dull; so he whipped out his Road Atlas of the Soviet Union and worked out a route via Yaroslavl Highway. The route in Bychkov’s mind turned out to be a circular one. Its ring encompassed the entire history of Vladimir the Great’s ancient Rus. It was a lucky hunch. Thousands of people had studied the history of Vladimir’s Princedom, but it had never occurred to anyone to link up the eight cities and five regions. When he got back, Bychkov wrote about each of the cities he had visited. Soon enough, he had a collection of eight essays. This “Golden Ring” series was accepted by his editors without any great enthusiasm. Later on, the same material was published under the same title in the magazine “Smena.” The picture on the cover of the magazine was not of any of the eight cities’ churches, but of the night sky split by a bolt of lightning. There was a political explanation for this. “This whole farrago took place during the Khrushchev era. So anything featuring a load of gold-domed churches would have been spiked immediately,” said Bychkov, in an interview with Strana.ru. In the 1960s, Yuri Bychkov helped found the All-Russia Society for the Preservation of Historic Monuments and Culture. His articles about the Golden Ring provoked interest in the Society, and they decided to set up a trip with scholars along the route. No one then could have imagined that Yuri had actually set up one of the first brand names in Russian tourism, yet, 20 years later, the Golden Ring of Russia guidebook had already been published in 10 different languages. In the 1970s, the concept of the “Golden Ring” was introduced to the broader public in the form of verse. The song was called “Lyrics & Melody Are Traditional,” but the author was somehow forgotten. The idea behind the song caught public imagination so powerfully that it stuck in the memory as something ancient, believable and impermeable – just like the Time of Troubles or Prince Vladimir's Kingdom of Rus. Cities that found themselves left out of Bychkov's Golden Ring berated him for this historic injustice. Still, attempts to create rival “Silver” and “Bronze” rings were a flop. Even the fortunate townships that were included on Bychkov’s route vied with each other for the right to the title of “Pearl” of the Golden Ring – city of the highest standing.